The English language is a marvellous thing, isn’t it? You are probably wondering who was drunk at school whereas my intended meaning is what was drunk at school. And both are perfectly valid interpretations of the same phrase. But drink is certainly the focus. This might seem odd to us but beer was supplied to the earliest pupils on a daily basis as the least deadly liquid intake that could be provided. Drinking water was unheard of and was more likely to quench life than quench thirst. Tea and coffee, supplied much later in the school’s history, was at the time a very expensive commodity kept in locked boxes and a status symbol for the very wealthy. Milk might have been an option if there had been any means of keeping it fresh. Instead it was served hot in porridge or milk puddings of various kinds – and was probably just as disliked then as schoolchildren view it now. Beer created in a brewery is made in enormous vats and from these smaller quantities are drawn off. The fermentation process is still continuing and only when this ceases is the cask bunged up to prevent the beer from going flat. During the ‘working off’ the beer in the cask is topped up when the process reduces the amount so the rule that the beer be worked off and bunged up was less to do with the possibility of exploding beer casks as to ensure that short supplies were not delivered! Part of the Matron’s salary was a 5gn allowance for porter. Porter was a dark beer, like stout, which was very popular in the C18th, particularly in London. Its name purportedly comes from its popularity with street and river porters. 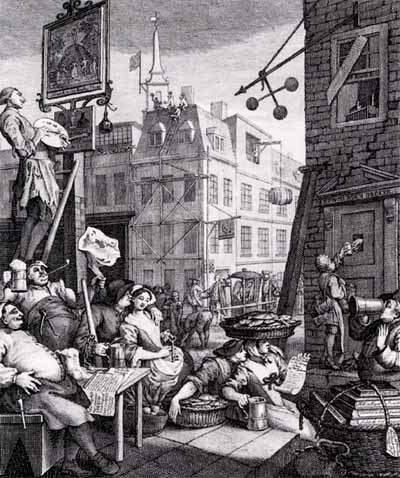 In the Hogarth image, Beer Street, there is a porter quaffing his porter in the bottom right, whilst a cask of beer is hoist over the street in the background. PUPILS FORCED TO DRINK WATER. Imagine the fuss it would have caused if the earliest pupils had been given anything other than beer!